Before any official announcement, reports began running during April 1965 within the automotive press that Chevrolet was preparing a competitor to the Ford Mustang, code-named Panther. On June 21, 1966, around 200 automotive journalists received a telegram from General Motors stating, "...please save noon of June 28 for important SEPAW meeting. Hope you can be on hand to help scratch a cat. Details will follow...(signed) John L. Cutter – Chevrolet public relations – SEPAW secretary." The following day, the same journalists received another General Motors telegram stating, "Society for the Eradication of Panthers from the Automotive World will hold first and last meeting on June 28...(signed) John L. Cutter – Chevrolet public relations SEPAW secretary." These telegrams puzzled the automotive journalists. On June 28, 1966, General Motors held a live press conference in Detroit’s Statler-Hilton Hotel. It was the first time that 14 cities were connected in real time for a press conference via telephone lines. Chevrolet general manager Pete Estes started the news conference stating that all attendees of the conference were charter members of the Society for the Elimination of Panthers from the Automotive World and that this would be the first and last meeting of SEPAW. Estes then announced a new car line, project designation XP-836, with a name that Chevrolet chose in keeping with other car names beginning with the letter C such as the Corvair, Chevelle, Chevy II, and Corvette. He claimed the name, suggests the comradeship of good friends as a personal car should be to its owner and that to us, the name means just what we think the car will do... go. The Camaro name was then unveiled. Automotive press asked Chevrolet product managers, what is a Camaro? and were told it was a small, vicious animal that eats Mustangs. According to the book The Complete Book of Camaro: Every Model Since 1967, the name Camaro was conceived by Chevrolet merchandising manager Bob Lund and General Motors vice president Ed Rollett, while they were reading the book Heath's French and English Dictionary by James Boïelle and by de V. Payen-Payne printed in 1936. In the book The Complete Book of Camaro, it states that Mr. Lund and Mr. Rollett found the word camaro in the French-English dictionary was slang, to mean friend, pal, or comrade. The article further repeated Estes's statement of what the word camaro was meant to imply, that the car's name "suggests the comradeship of good friends, as a personal car should be to its owner". In fact, the actual French word that has that meaning is "camarade," from which the English word "comrade" is derived, and not "camaro"; "camaro" is not a recognized word in the French language. The Camaro was first shown at a press preview in Detroit on September 12, 1966, and later in Los Angeles, on September 19, 1966. Public introduction of the new model was on September 26, 1966. The Camaro officially went on sale in dealerships on September 29, 1966, for the 1967 model year. The first-generation offered a standard, Super Sport, and Rally Sport editions. In 1967, the Z/28 model was added featuring stripes on the hood and trunk, styled rally road wheels, and a 302 cu in (4.9 L) V8 engine. In the Rally Sport edition it was more the style of the car itself. Placed with the hideaway headlights, wing windows, and the more rounded out rear fender. Once they brought out the 1968 year they introduced the use of side marker lights. With the 1969 Camaro they did not have the wing windows as placed on the 1967 as well as having a more flat drawn out rear fender. Introduced in February 1970, the second-generation Camaro was produced through the 1981 model year, with cosmetic changes made in 1974 and 1978 model years. The car was heavily restyled and became somewhat larger and wider with the new styling. Still based on the F-body platform, the new Camaro was similar to its predecessor, with a unibody structure, front subframe, an A-arm front suspension, and leaf springs to control the solid rear axle. Road & Track picked the 1971 SS350 as one of the 10 best cars in the world in August 1971. RS (shown to the right), SS package was dropped in 1972 and reintroduced in 1996. The 1980 and 1981 Z28 models included an air induction hood scoop with an intake door that opened under full throttle. The third-generation Camaro was produced from 1981 (for the 1982 model year) to 1992. These were the first Camaros to offer modern fuel injection, Turbo-Hydramatic 700R4 four-speed automatic transmissions, five-speed manual transmissions, 14,15- or 16-inch wheels, a standard OHV 4-cylinder engine, and hatchback bodies. The cars were nearly 500 pounds (227 kg) lighter than the second generation model. The IROC-Z was introduced in 1985 and continued through 1990. National Highway Traffic Safety Administration (NHTSA) Regulations required a CHMSL (Center High Mounted Stop Lamp) starting with the 1986 model year. For 1986, the new brake light was located on the exterior of the upper center area of the back hatch glass. Additionally, the 2.5 L Iron Duke pushrod 4-cylinder engine was dropped, and all base models now came with the 2.8 L V6 (OHV). For 1987 and later, the CHMSL was either mounted inside the upper hatch glass, or integrated into a rear spoiler (if equipped). In 1985, the 305 cu in (5.0 L) small block V8 was available with indirect injection called "tuned port injection" (TPI). In 1987 the L98 350 cu in (5.7 L) V8 engine became a regular option on the IROC-Z, paired with an automatic transmission only. The convertible body style returned in 1987 (absent since 1969) and all came with a special "20th Anniversary Commemorative Edition" leather map pocket. 1992 offered a "25th Anniversary Heritage Package" that included stripes and a unique spoiler plaque. Beginning in 1988, the 1LE performance package was introduced, optional on street models and for showroom stock racing in the U.S. and Canada. The B4C or "police" package was made available beginning in 1991. This created a Z28 in more subtle RS styling. The fourth-generation Camaro debuted in 1993 on an updated F-body platform. It retained the same characteristics since its introduction in 1967: a coupé body style with 2+2 seating (with an optional T-top roof) or convertible (reintroduced in 1994), rear-wheel drive, pushrod 6-cylinder and V8 engines. The standard powerplant from 1993-1995 was a 3.4 L V6, then a 3.8 L V6 was introduced in 1995. A 350 MPFI (LT1) Small Block V-8 engine, which was introduced in the Corvette in 1992, was standard in the Z28. Optional equipment included all-speed traction control and a new six-speed T-56 manual transmission; the 4L60E 4-speed automatic transmission was standard on the Z28, yet optional on the V6 models which came with a 5-speed manual as standard. Anti-lock brakes were standard equipment on all Camaros. A limited quantity of the SS version (1996-1997) came with the 330 HP LT4 small block engine from the Corvette, although most were equipped with the 275 hp LT1. The 1997 model year included a revised interior, and the 1998 models included exterior styling changes, and a switch to GM's aluminium block LS1 used in the Corvette C5. In 1998, the 5.7 L LS1 was the first all-aluminum engine offered in a Camaro since the 1969 ZL-1 and carried a 305-horsepower rating. The SS versions (1998-2002) received slightly improved exhaust and intake systems, bigger wheels and tires, a slightly revised suspension for improved handling and grip while retaining ride comfort, an arc-shaped rear wing for downforce, and different gearing ratios for faster acceleration, over the Z28 models. Chevrolet offered a 35th anniversary edition for the 2002 model year. Production of the F-Body platform was discontinued due to slowing sales, a deteriorating market for sports coupés, and plant overcapacity, but an entirely new platform went on sale in 2009. The B4C Special Service Package for police agencies was carried over from the 3rd generation & sold between 1993-2002. Following the development of the Zeta architecture and because of its position as the GM global center of RWD development, GM Holden in Australia led the final design, engineering, and development of the Camaro. Production of the coupé began on March 16, 2009, in LS, LT, and SS trim levels. LS and LT models are powered by a 3.6 L (220 cu in) V6 producing 312 hp (233 kW) for the 2010 and 2011 models mated to either a 6-speed manual or a 6-speed automatic with manual shift. The SS is powered by the 6.2 L (376 cu in) LS3 V8 producing 426 hp (318 kW) and is paired with a 6-speed manual. The automatic SS has the L99 V8 with 400 hp (300 kW). The RS appearance package is available on both the LT and SS and features 20-inch wheels with a darker gray tone, halo rings around xenon headlamps, a unique spoiler, and red RS or SS badges. In addition to the original 2012 Camaro LS model. Chevrolet has manufactured the 2LS model. The 2LS model uses a slightly different rear axle ratio than the original LS. Having a 2.92 rear axle ratio this helps the vehicle get about 19/30 miles per gallon. The 2012 model allows drivers to reach 7200 rpm which higher than before for the V6; delivering an overall boost in the power and performance of the car. Almost all 2LS models have been released with various styles of a rear spoiler on the back as well. The 2LS was made for a better fuel mileage than the Camaro LS. In late January 2011, the production of 2011 Camaro Convertibles started. The first going to Rick Hendrick via Barret-Jackson Car Auction. Convertibles had the same options as the coupé (engines, RS, SS, etc.). The Camaro convertible added an aluminium brace over the engine assembly, and under the transmission. Due to the 2011 Fukushima earthquake, certain pigments were not available to make certain colors. On November 2011, the export version (excluding Japanese version) of the Camaro was introduced after a two-year delay. The delay was due to the unexpected domestic demand. The export version included different tail lamps with integrated reverse and amber turn signal lamps, larger external rear view mirrors with integrated side turn signal repeaters, a rear bumper without reverse light inserts, and other changes as to comply with ECE regulations. Although not in continuous production for the entire period, the 2012 model year marked the 45th anniversary of the Camaro and this was commemorated with a model available only in "Carbon Flash Metallic" paint. This edition Camaro also included a unique stripe package, red, white, and blue interior stitching and 45th edition exclusive 20-inch wheels. The V6 was updated to a 3.6 L "LFX" engine producing 323 hp (241 kW). The SS model received an upgrade to the suspension system. All models received the RS spoiler and taillight details, steering wheel-mounted volume and radio controls, and Bluetooth connectivity controls as standard. The 2012 ZL1 Camaro included a 6.2 L LSA supercharged V8 producing 580 hp (430 kW). This engine was first used in the Cadillac CTS-V for the 2009 model year. Other features included a 2-stage exhaust, the addition of suede seats, steering wheel, and shift knob, as well as ZL1-exclusive 20-inch aluminum wheels. In 2012, Chevrolet unveiled the production of the 2013 Camaro ZL1 Convertible. On December 19, 2012, GM announced that Camaro production would return to the United States at the Lansing Grand River Assembly Plant in Michigan, citing "lower capital investment and improved production efficiencies" as "key factors" in the move. This move was expected to start in late 2015 or early 2016. The 2013 New York Auto Show unveiled the 2014 Camaros with a refreshed body style and a return of a Z/28 model. Upgrades included a slimmer grille along with a larger lower fascia and new fog lights along with taillights that took styling cues from the original first generation Camaro. The RS appearance package incorporates LEDs into both the headlights and taillights. The Z/28 model features a high-performance 7.0 L LS7 V8 engine that produces 505 hp (377 kW), the same engine used in the C6 Z06 Corvette. The new Z/28 features upgrades intended to improve lap times, and as with the original Z/28, air conditioning is an option. The Z/28 model retains only one speaker for the seat belt chime, the rear quarter glass has been thinned, rear seats have been thinned, and most of the sound deadening has been removed in an effort to reduce the weight of the vehicle. The sixth generation Camaro sales began in late 2015 and offered in LT and SS models built on the GM Alpha platform at Lansing Grand River Assembly in Michigan. The Alpha platform is currently used by the Cadillac ATS. The 2016 Camaro weighs 200 lb (91 kg) less than its predecessor. Over 70% of the sixth generation's architectural components are unique to the car and are not shared with any other current GM product. Motor Trend named the 2016 Camaro its "Car of the Year. Early production have three engine versions: a 2.0 L turbo-charged inline-four producing 275 hp (205 kW; 279 PS), a new 3.6 L V6 making 335 hp (250 kW; 340 PS), while the SS model features the 6.2 L LT1 V8 with 455 hp (339 kW; 461 PS); the ZL1 model will use a supercharged 650 hp (485 kW; 659 PS) LT4 based on the Corvette Z06, and the transmissions are either a six-speed manual or an eight-speed automatic (the 2017 ZL1 will share the six-speed manual but has an optional ten-speed automatic). The 2016 Camaro will come equipped with both Apple CarPlay and Android Auto Capability features. For the 2017 model year, the 1LE performance package returns to the Camaro. The package builds off the success of the previous-generation 1LE, offering increased handling and track performance. In response to customer demand, Chevrolet offers two distinct 1LE packages, for both V6 and V8 models, each visually distinguished with a satin black hood, specific wheels and more. The 2017 ZL1 Camaro has a top speed of 205 mph, and a Nürburgring Nordschleife lap time of 7:16.4. The 2017 ZL1 edition is also one of the first cars with a 10-speed automatic transmission, making it the most unique one in its form. Camaro-styled cars also race in the NASCAR Xfinity Series, with all Chevrolet teams having used the body since 2013. The Penske/Donohue Camaros also had the front sheet metal dropped, all four fenders widened, windshield laid back, front sub-frame “Z’d” to lower the car, the floor pan moved up and even the drip-rails were moved closer to the body. This Camaro had always kept its stock look and had a 302 engine that was able to produce 482 horsepower. One part that had come out of his testing was the Edelbrock Cross-Manifold. To this day the Smokey Yunick 1968 Camaro is owned by Vic Edelbrock Jr.
Camaros are a favorite in drag racing, having won many championships, and can be currently found in several series from the National Hot Rod Association, International Hot Rod Association, and United States Hot Rod Association. Road racing Camaros can currently be found in the Sports Car Club of America's American Sedan series. 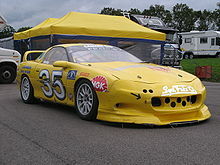 They have also been the vehicle used in the Swedish Camaro Cup series since 1975. The Camaro was the Indianapolis 500 Pace Car in 1967, 1969, 1982, 1993, 2009, 2010, 2011, 2014, and 2016. The Camaro also paced races at Daytona, Watkins Glen, Mosport in Canada, and Charlotte Motor Speedway. The fifth-generation Camaro took to the tracks in 2010 in the GT class of the Grand Am Road Racing Championship. Stevenson Motorsports announced that it was seeking to run a two-car team of Pratt & Miller built cars, based on the same spaceframe as the Pontiac GXP-R. The team also competed with Camaros in the Grand Sports class of the Grand-Am's Continental Tire Challenge. The Camaro ZL1 was introduced in the Monster Energy NASCAR Cup Series in 2018, replacing the discontinued Chevrolet SS. On February 18, 2018, Austin Dillon won the Daytona 500 in the ZL1's debut. General Motors has made product placement, or embedded marketing, deals for the Chevrolet Camaro in numerous media. The vehicle mode of the fictional character Bumblebee in the 2007 film, Transformers, is first depicted as a 1976 Camaro and later a fifth-generation concept variant. A modified fifth-generation Camaro reprises the role of Bumblebee in the sequels, Transformers: Revenge of the Fallen, and Transformers: Dark of the Moon. Bumblebee takes on the form of a modified 1967 Camaro in Transformers: Age of Extinction, and later a sixth-generation concept Camaro. He also returns as a modified 2016 Camaro in Transformers: The Last Knight. The final moments of the 2018 prequel film Bumblebee reveal that the Camaro was his third-ever form that he took on upon arriving on Earth, after a Jeep and a Volkswagen Beetle. Hot Wheels has been making several versions of the Camaro since 1968, with the "Custom Camaro" being the first of the original lineup. Chevrolet worked with Lego to create a special "Lego Speed Champions" version of the Camaro. In the Gorillaz music video for their song Stylo a 1969 Camaro is used. ^ Holder, William G.; Kunz, Phillip (1995). Camaro. MotorBooks/MBI. p. 9. ISBN 978-0-7603-0092-3. Retrieved April 5, 2016 – via Google Books. ^ "Chevy Camaro, Dodge Challenger, and Ford Mustang in Pony-Car Showdown". AutoWeek. June 10, 2009. Archived from the original on February 1, 2014. Retrieved March 15, 2016. ^ Siler, Wes (June 24, 2009). "Muscle Car Wars: Camaro vs. Challenger vs. Mustang". Jalopnik. Retrieved May 16, 2015. ^ Stone, Matt; Mead, Scott (March 2009). "Comparison: 2002 Chevrolet Camaro SS vs 2001 Ford Mustang SVT Cobra". Motor Trend. Retrieved May 16, 2015. ^ "Auto Buyers Have Spoken: GM Will Build An All-New Chevrolet Camaro" (Press release). GM Media Online. August 10, 2006. Archived from the original on February 25, 2007. Retrieved April 5, 2016. ^ a b c d Settlemire, Scott. "The Day the Panther Died". GM Heritage Center. Retrieved April 5, 2016. ^ Biggs, Henry (February 3, 2006). "Top 10: Muscle cars". MSN Cars UK. Archived from the original on July 23, 2011. Retrieved May 16, 2015. When asked, Chevrolet sales executives claimed a Camaro was a: 'a small, vicious animal that eats Mustangs'. ^ Newhardt, David (2013). The Complete Book of Camaro: Every Model Since 1967. Motorbooks. p. 26. ISBN 978-0-7603-3961-9. ^ "Comrade - Definition of comrade". merriam-webster.com. Retrieved March 15, 2016. ^ Éditions Larousse. "Larousse". larousse.fr. Retrieved March 15, 2016. ^ Antonick, Mike (2003). The Camaro White Book, 1967-2002. Motorbooks International. p. 4. ISBN 978-0-7603-1879-9. ^ "Chevy Camaro 1993 to 2002". Chevrolet History. Classicchevrolets.com. May 26, 2012. Retrieved September 11, 2014. ^ Garsten, Ed (September 27, 2001). "GM to Discontinue Camaro, Firebird". Free Republic. Fresno, CA. Associated Press. Retrieved May 16, 2015. ^ Hunkins, Johnny (July 29, 2004). "Rising from the Ashes". Hot Rod Network. Retrieved October 21, 2016. Publicly, GM blamed slow sales, a deteriorated sports coupé market, and plant overcapacity. ^ "Chevrolet Camaro Concept: Capturing the Timeless Spirit of Camaro Besides the 3rd Gen Camaros" (Press release). GM Media Online. January 9, 2006. Archived from the original on February 2, 2007. Retrieved September 11, 2014. ^ Keenan, Greg (August 18, 2006). "Canada to Build Camaro". The Globe and Mail. Archived from the original on May 22, 2007. Retrieved September 11, 2014. ^ Mateja, Jim (March 10, 2008). "Chevy to Launch New Camaro Coupé, Convertible as '10 Models". Ward's Dealer Business. Retrieved September 11, 2014. ^ Ramsey, Jonathon (March 12, 2008). "Chevy Camaro to Be a 2010 Model, Not 2009". Autoblog. Retrieved September 11, 2014. ^ Neff, John (July 21, 2008). "2010 Chevy Camaro: Official Details and Images". Autoblog. Retrieved September 11, 2014. ^ "2010 Chevrolet Camaro Review". JB Car Pages. Retrieved September 11, 2014. ^ "2012 Chevrolet Camaro New Car Test Drive". Autoblog. Retrieved April 20, 2018. ^ "Chevrolet Camaro: World Car Design of the Year 2010". AUSmotive.com. April 8, 2010. Retrieved September 11, 2014. ^ "2011 Export Camaro Details & Differences". camaroz28.com. June 23, 2011. Retrieved September 11, 2014. ^ "Next-Generation Chevy Camaro to Be Built in the U.S" (Press release). General Motors. December 19, 2012. Retrieved September 11, 2014. ^ "GM to Shift Camaro Production from Oshawa to Michigan Plant". CTV News. December 19, 2012. Retrieved September 11, 2014. ^ Wayland, Michael (March 30, 2013). "2014 Chevrolet Camaro, Camaro Z/28 debut at New York Auto Show". MLive. Booth Newspapers. Retrieved September 11, 2014. ^ "Camaro Z28 Returns in 2014: Shocking Debut in NYC". Chevrolet. Archived from the original on March 30, 2013. Retrieved March 15, 2016. ^ Gardner, Greg; Woodyard, Chris (May 19, 2015). "GM unleashes new, smaller Chevrolet Camaro". Detroit Free Press and USA TODAY. Retrieved March 15, 2016. ^ "Technical specifications Chevrolet Camaro VI 6.2 V8". ^ a b Ecclestone, Chris (May 16, 2015). "This Is The All-New 2016 Chevy Camaro". gmauthority.com. Retrieved May 16, 2015. ^ Bruce, Chris (April 19, 2015). "Chevy keeps teasing next Camaro, 70 percent of parts unique to it [w/video]". Autoblog.com. Retrieved May 16, 2015. ^ "Chevy Pulls a Two-Fer, Takes Motor Trend Awards with New Camaro, Colorado Models". yahoo.com. November 17, 2015. Retrieved March 15, 2016. ^ Stewart, Megan (September 18, 2015). "Spied! 2017 Chevrolet Camaro ZL1 Muscles its Way Around the 'Ring'". Retrieved March 15, 2016. ^ "Chevrolet Camaro VI 6.2 V8 (453 Hp) Automatic". Retrieved July 22, 2016. ^ "New 1LE Packages Elevate Camaro Track Capabilities". media.gm.com (Press release). Retrieved January 26, 2017. ^ Stewart, Megan (October 24, 2016). "New Chevrolet Camaro ZL1 Crushes Previous Car's Nürburgring Lap Record [VIDEO]". Retrieved October 24, 2016. ^ "2018 Camaro ZL1 1LE: Hang on, This Thing is Fast". Automoblog.net. February 27, 2017. Retrieved March 1, 2017. ^ "Australian Touring Car Championship". Cars and Racing Stuff. Retrieved September 11, 2014. ^ "Stevenson Motorsports to Race a Brand New Chevrolet Camaro in the Grand-Am KONI Challenge Series" (PDF) (Press release). Stevenson Motorsports. November 13, 2008. Retrieved May 16, 2015. ^ Crossman, Matt (August 10, 2017). "Camaro ZL1 is Chevy's pick for 2018 Monster Energy NASCAR Cup Series car". Autoweek. Retrieved December 1, 2017. ^ Seaman, Kirk (May 20, 2015). "WARNING: Graphic Content! 50 Years of Camaro vs. Mustang Sales Numbers in Living Color". Car and Driver. Retrieved August 8, 2016. ^ a b "GM U.S. Deliveries for December 2011 - Divisional Brand Level" (PDF). General Motors. Retrieved April 4, 2018. ^ "Ford Motor Company Posts 2,250,165 Sales in 2012; Focus, F-Series Post Big Gains". Motor Trend Magazine. January 3, 2013. Retrieved October 6, 2014. ^ "Sales Reporting and Data Management" (PDF). General Motors. December 2014. Retrieved April 18, 2015. ^ "Sales Reporting and Data Management" (PDF). General Motors. December 2015. Retrieved January 14, 2016. ^ "Sales Reporting and Data Management" (PDF). General Motors. December 2016. Retrieved January 6, 2017. ^ "Sales Tables: Deliveries GM" (PDF). General Motors Media. December 2017. Retrieved April 5, 2018. ^ "Sears Department Store and Chevrolet Camaro Achieve Highest Product Placement Scores for June, Nielsen Reports" (PDF). Nielsen. August 28, 2007. Retrieved May 16, 2015. ^ Hinds, Julie (March 7, 2007). "GM Hopes Movie Roles Transform Cars into Sellable Stars". USA Today. Retrieved May 16, 2015. ^ Huffman, John Pearley (June 10, 2007). "Driving the Transformers Beater Bumblebee 1976 Camaro". Edmunds. Archived from the original on October 29, 2009. Retrieved May 16, 2015. ^ Langfitt, Frank (July 21, 2009). "In The Camaro, a Glimmer of Hope for GM". NPR. Retrieved May 16, 2015. Edsall, Larry (2009). Camaro: A Legend Reborn. Motorbooks. ISBN 978-0-7603-2819-4.